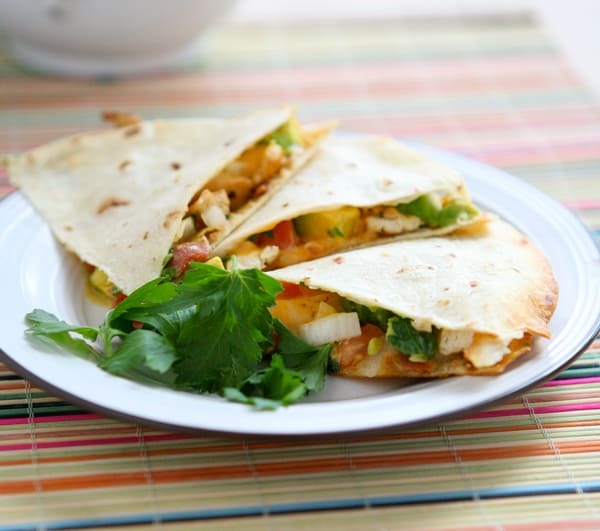 Do you love club sandwiches, and quesadillas? I do, so I wanted to combine two of my favorite things into this delicious quesadilla. 1. Cook bacon until crisp and set aside. Salt and pepper sliced chicken and add to skillet with bacon fat. Cook until browned and remove from pan. 2. Add chopped tomatoes, avocado, onion, parsley and lemon juice to a large bowl. Add salt and pepper. Toss. 3. Preheat oven to 450 degrees. Rub olive oil on one side of a flour tortilla. Lay tortilla on baking sheet, oiled side down. Add chicken, bacon, tomato and avocado mixture. Add cheese. Top with another tortilla and rub the top of it with a little more olive oil. 4. Bake at 450 degrees until lightly browned and crisp.